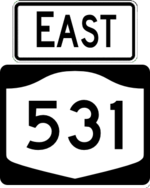 NY 531 is a short freeway on the west side of Rochester. The initial section to open, built as part of the plan to extend I-990 from Buffalo to Rochester via Lockport, extended from I-490 to NY 386. It was extended west to Manitou Road and then later to NY 36. 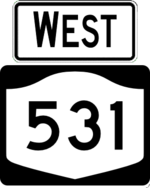 There was an effort to extend the freeway west to Redman Road in Brockport, but these plans were dropped in favor of spot improvements on NY 31.